Note: this document uses a version of XAMPP released in January 2018. 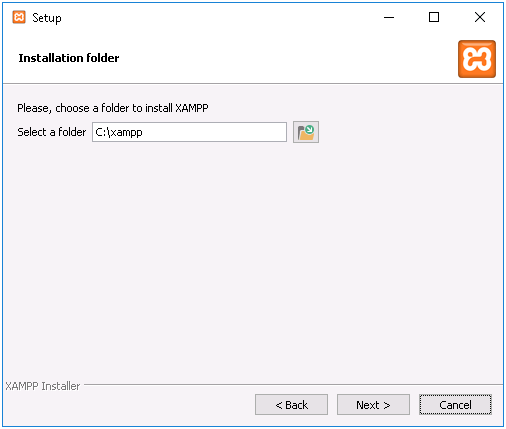 If you're looking for documents of previous versions of XAMPP, check these documents: How to install Team Password Manager on Windows using XAMPP (2015) and How to install Team Password Manager on Windows using XAMPP (2014). If you want to install Team Password Manager on a Windows system you will also need to install the required server components to run it: web server, PHP and MySQL. You can either install these "manually" one by one, or you can use something like XAMPP. 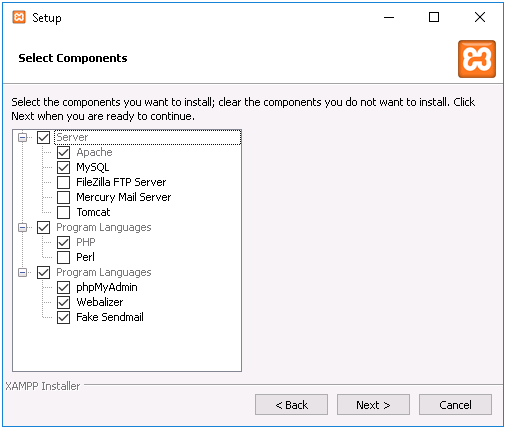 XAMPP (https://www.apachefriends.org) provides a convenient and quick way to install Apache, PHP and MySQL (and more) on Windows systems so that you can quickly proceed to install Team Password Manager and have a system up and running in no time. Note: this guide uses Windows Server 2016, but you can install Team Password Manager on almost all Windows systems, from XP to Windows 10. 1.1 Download XAMPP from https://www.apachefriends.org/download.html. 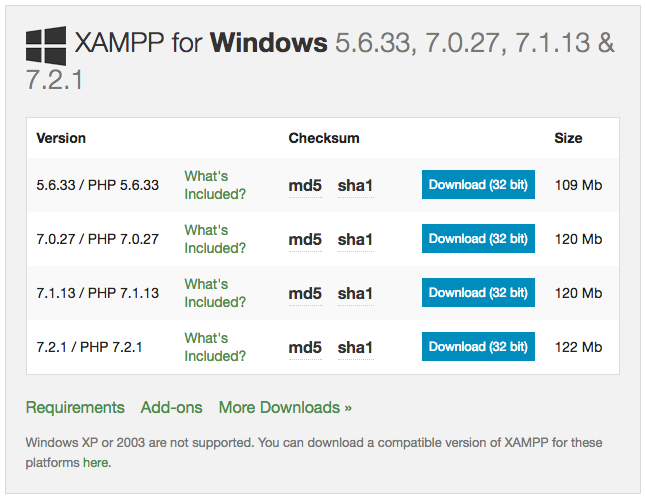 Check the requirements section to choose which version of XAMPP to use depending on your Windows system. Team Password Manager requires PHP 5.6+ (7.3 not yet, and if you're using a version lower than 7.84.198 you need PHP 5.6+ to 7.0+). 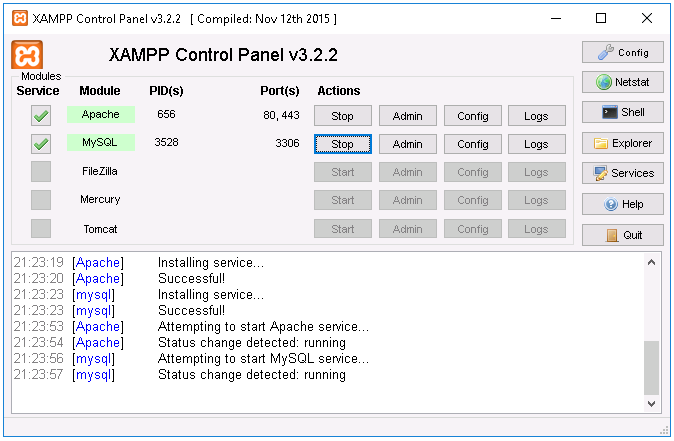 For this tutorial we choose XAMPP v.7.0.27. 1.2 Execute the XAMPP installer. 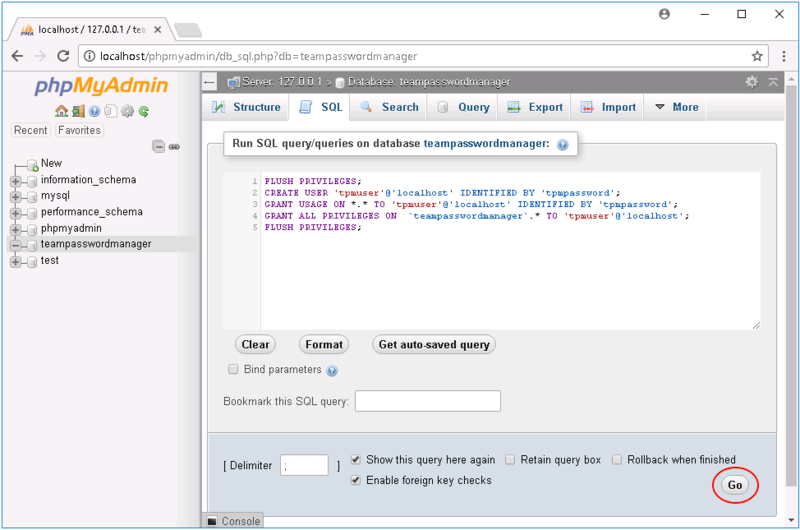 You can select all the components or just the ones required to run Team Password Manager (Apache, PHP and MySQL). 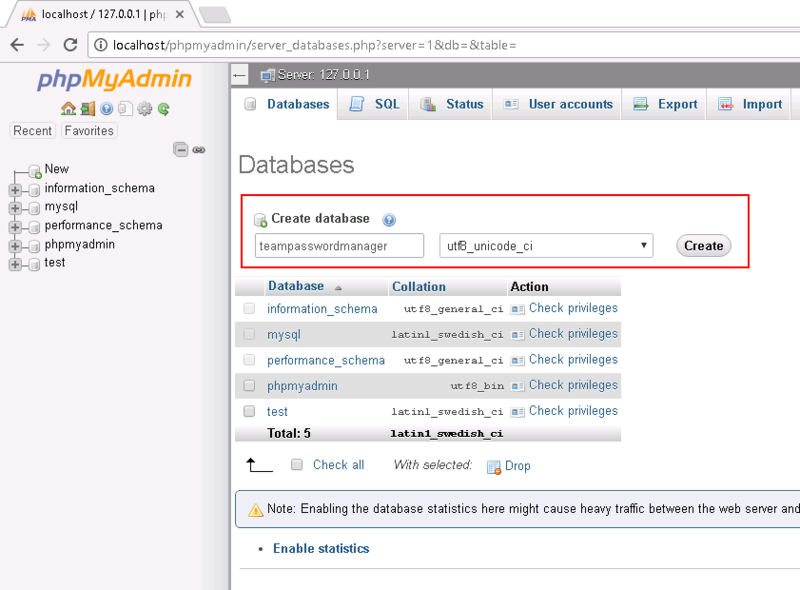 Select also phpMyAdmin, we'll use it to create the database. Also, for this tutorial, we're going to be using the default folder which is c:\xampp, but you may choose another one (there's an UAC warning when you execute the installer that you can ignore if you use c:\xampp). 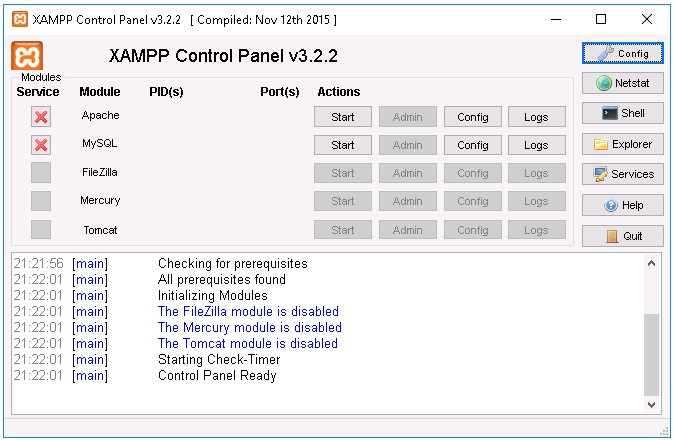 1.3 When the installer has finished, open the XAMPP Control Panel. 1.4 Click on the "Service" checkboxes for Apache and MySQL to enable Apache and MySQL as services. 1.6 Check that XAMPP is working by opening your browser and navigating to http://localhost. You should see the XAMPP dashboard. Note that the webroot of your new http server (http://localhost) is c:\xampp\htdocs. Note: this is only required for PHP 5.6+. PHP 7.x doesn't need it. 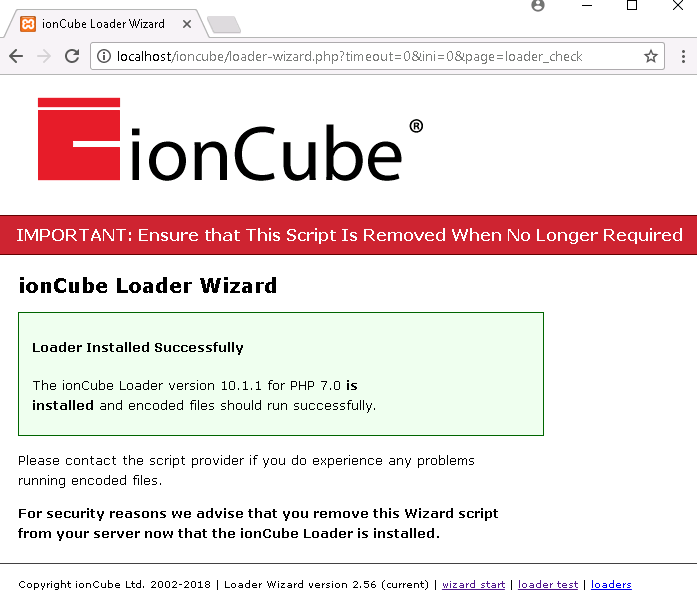 2.2 Decompress loader-wizard.zip and copy loader-wizard.php to c:\xampp\htdocs\ioncube (you need to create this folder). 2.5 IMPORTANT!! 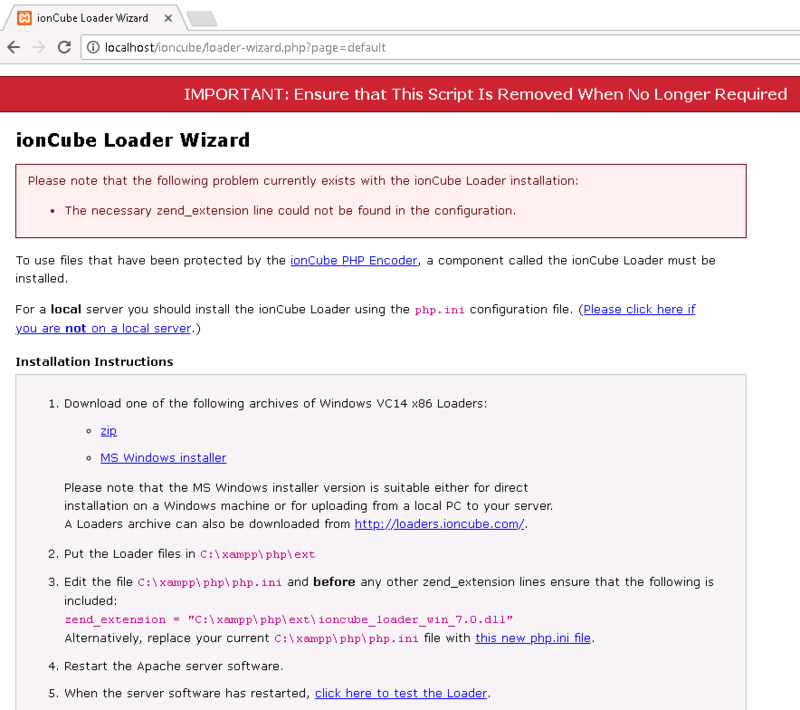 Delete the wizard (loader-wizard.php) from c:\xampp\htdocs\ioncube. 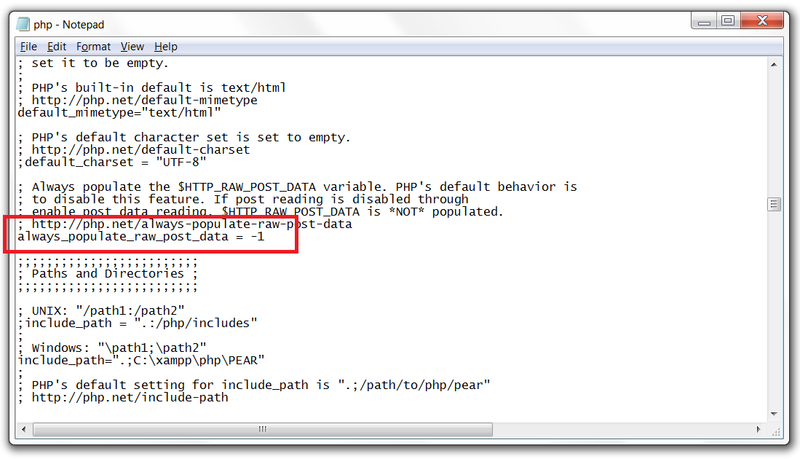 3.1.1 Point your browser to http://localhost/phpmyadmin. 3.1.2 Click on the "Databases" tab. 3.1.4 You'll see that the newly created database appears on the left sidebar, click on it and select the "SQL" tab. 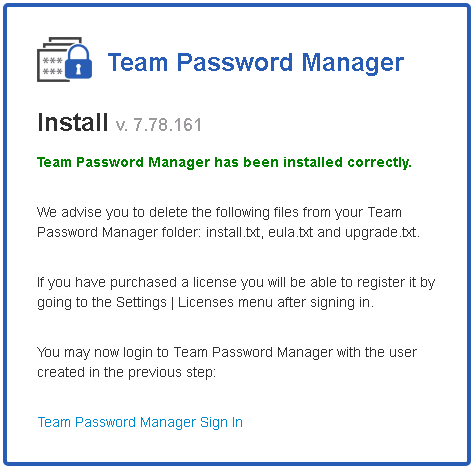 3.2.1 Download the latest version from http://teampasswordmanager.com/download/. Congratulations, Team Password Manager is installed! You can now sign in with the username and password just entered. 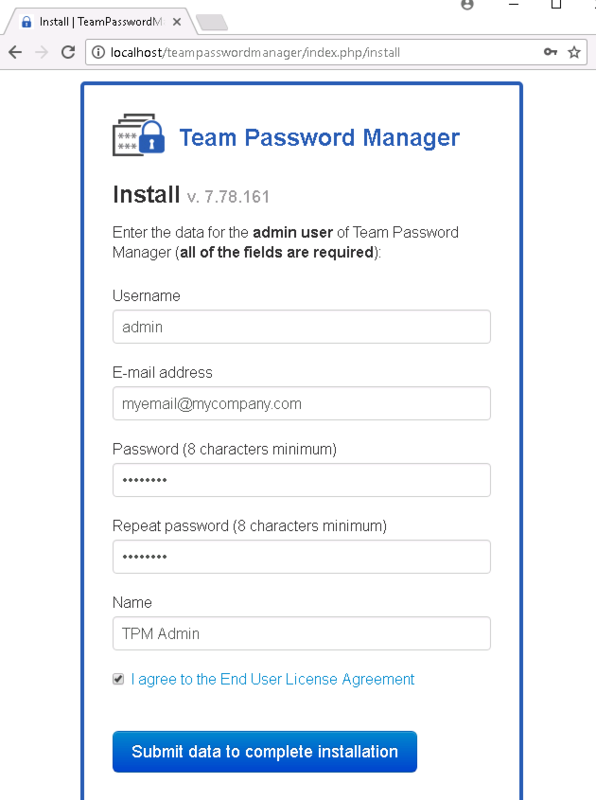 Team Password Manager is free for 2 users and 5 projects, but to fully test it you can get a trial license for 30 days at http://teampasswordmanager.com/trial/. 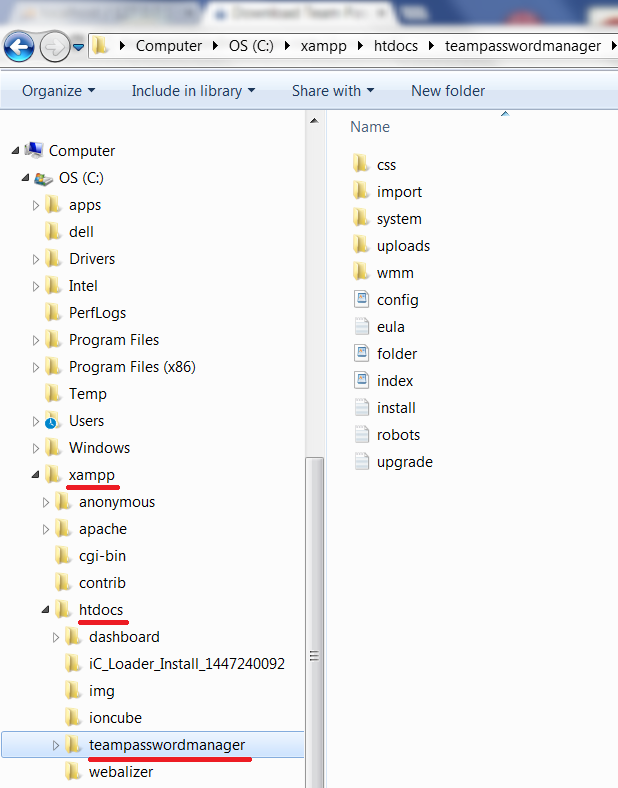 This creates a two files, myserver.key and server.csr. myserver.key is the private key, and you should protect it and not disclose it to anyone. server.csr is the CSR file. You'll be required to copy and paste its contents into the online enrollment form when requesting the certificate. 5.2 Purchase the certificate from a Commercial Authority. We've used Namecheap (PositiveSSL certificate) but you can use any CA that you like. As outlined before, you'll need to copy the information in the CSR file (everything from -----BEGIN CERTIFICATE REQUEST to END CERTIFICATE REQUEST-----) and paste it on the indicated form. You'll also need to validate your domain, the CA will provide various methods for doing so. The CA will then provide you with two files (the certificate): yourDomainName.crt and yourDomainName.ca-bundle. Copy yourDomainName.crt and yourDomainName.ca-bundle to this folder c:\xampp\apache\conf\ssl.crt. 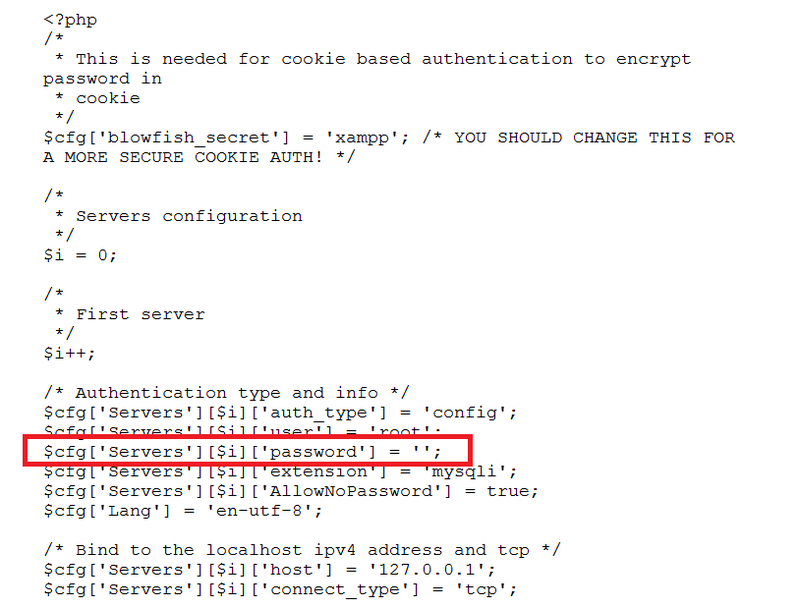 Copy myserver.key to this folder c:\xampp\apache\conf\ssl.key. Change DocumentRoot to the Team Password Manager folder: DocumentRoot "C:/xampp/htdocs/teampasswordmanager". This will make https://xampptest.teampasswordmanager.com open Team Password Manager, not the XAMPP dashboard. Save the changes and restart Apache. 5.4 Have your domain point to your Team Password Manager server. We want https://xampptest.teampasswordmanager.com to reach our server. To do so, go to your DNS management system and add the IP address of the server (here 1.2.3.4 is used as an example) to the DNS: xampptest A 1.2.3.4. Please check your DNS documentation for doing so. Note that if your server is not publicly accessible you must provide the IP address of your router and direct http (port 80) and https (port 443) traffic to your server. 5.5.1 Open Windows Firewall and click on "New Rule...". 5.5.2 Select "Port" as Rule Type. 5.5.3 In Protocols and Ports, select "TCP" and enter "80,443" in Specific local ports (we're opening both http and https ports). 5.5.4 Select "Allow the connection" as Action. 5.5.5 Check Domain, Private and Public as Profile. 5.5.6 Set a name for the rule and finish.